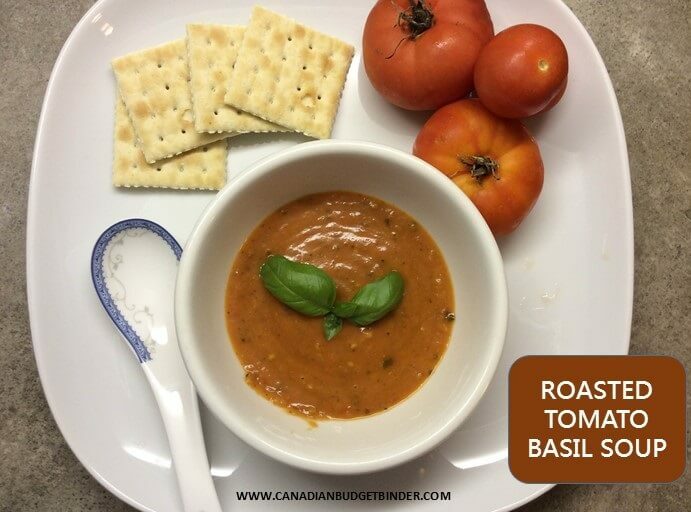 Roasted Tomato Basil Soup is perfect for the Fall season especially if you had a garden full of tomatoes and too much basil. Nothing quite soothes the soul than a hot bowl of soup especially after the week I had to endure. I made Roasted Tomato Basil Soup because I fell ill which landed me in the hospital with stomach flu. Thankfully I was only in overnight but was told to take it easy, consume plenty of fluids and to rest. As every parent knows “Rest” just doesn’t happen, but I dutifully went to my bed for a day before thinking about getting up. I did take it easy and hubby was in the kitchen cooking and organizing the kids. Luckily, I had some freezer meals already prepped so it was just a case of defrosting and serving up. It doesn’t get any easier than that for my husband. I on the other hand was on liquids only for the first couple of days so that was clear chicken broth, Jello, sweet tea and coffee but with no milk. It really doesn’t help when you smell good food, you are hungry but know you can’t have it or you will get sick. Now I want to cook which is a good sign because being out of the kitchen is not normal for me. My family loves my cooking and I don’t know what I would do if I couldn’t cook for my family. If you are a tomato soup lover you will go crazy for this Roasted Tomato Basil Soup. I was in the mood for something that would fill me up and make me feel good afterwards and this soup did the trick. This Roasted Tomato Basil Soup is the easiest soup to make when you are in a rush as it’s ready from start to finish in 35 minutes.The best part besides how good it tastes is what the house smells like while roasting those gorgeous tomatoes in the oven. A sweetness fills the air and reminds you of summer love. I love this Roasted Tomato Basil Soup as its so simple but hearty and tastes of an organic garden with all the fresh herbs and cherry tomatoes. This roasted tomato basil soup is the perfect soup to make with your organic tomato and basil harvest from the summer garden. It's a soul filling soup for a Fall day. On a large baking sheet cover with foil then place parchment paper on top. This will ensure nothing sticks and you keep all the juices inside the pan. Tip the tomatoes and onions into the pan and then rip basil leaves over the top. Place in the oven for 30 mins at 190oC/374oF. Once cooked pour carefully into a blender the roasted vegetables and juice from tomatoes. Add in the olive oil, Rosemary, Parsley, sea salt sugar and pepper and blend until smooth. There you have it an easy Fall meal that pairs nicely with my homemade baps. Both recipes don’t require much work but tastes like you were slaving all day in the kitchen! This Roasted Tomato Basil Soup will freeze well for up to 3 months. Another one of your gems from the kitchen Nicola!!! Hope you continue to feel better each day! !